It appears that Douglas is forming in the monsoon trough south of the Gulf of Tehuantepec. It may be upgraded to a depression later this afternoon or maybe tomorrow. Last edited by Caribbean Traveler on Tue Jul 01, 2008 11:59 pm, edited 1 time in total. The monsoon trough is still very active. The low at the surface is still very broad and it may still take another 24 hours before forming into a depression. This one will need to be watched more closely than Boris or Christina, because of its proximity to land. The unsettled weather continues to organize. The low pressure center is still a bit broad although heavy convection is increasing quickly. A depression should be named sometime later today or possibly early tomorrow. Forecasts show this developing into a tropical storm. There is potential for it to come inland in a few days, so interests especially near Puerto Vallerta and Manzanillo should keep an eye on this system. No change from earlier today. 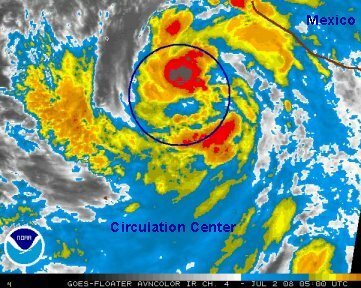 Lots of convection with the center of circulation slowly forming. We still expect this to develop. The larger the circulation center the more time in general to get a low spinning. 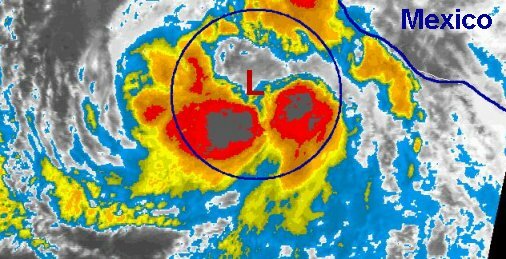 The disturbance is slowly becoming more organized and as mentioned before, we're only waitling for NHC to officially call it a depression. NHC just upgraded to t.s. Douglas. The deepest convection is on the south and west side over water at the present time. NHC only strengthens Douglas to 50 kts over the next few days. We believe that Douglas could reach hurricane strength. 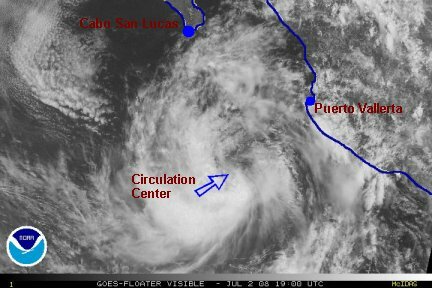 The southern tip of the Baja needs to watch the progress of the t.s. We believe that NHC's track looks pretty good right now deeping the system southwest of the peninsula. 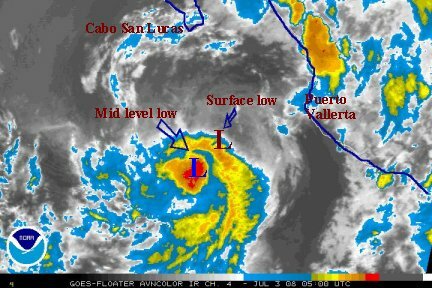 Douglas is about 350 miles south of Cabo San Lucas. It is moving farther west then the NHC offical track. The heaviest convection remains mostly south of the center. The worst of the weather will pass well south of Baja if this current trend continues. Douglas is being sheared at this time. The low level center appears to be northeast of the mid level center. 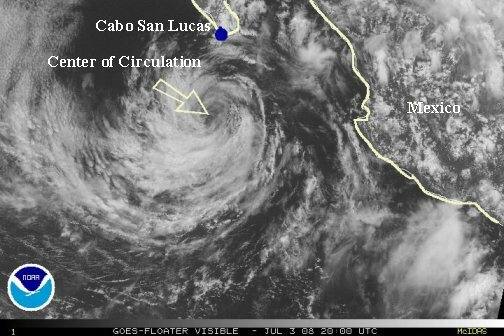 The deepest convection remains on the south side of the circulation which is good for Cabo. We'll see if Douglas tries to make a run at strengthening before it gets over colder water. Douglas is a depression. A very impressive change of events through the last 12 hours. The shear destroyed all of the convection and nothing of Douglas except the low level swirl is left. With Douglas heading toward cooler ocean water, it is unlikely to make any significant comeback. This will be the last update on Douglas unless regeneration occurs.